If you’ve not made the trek into Surfers Paradise for a while, you’re not going to believe what’s been evolving at a landmark 1980s property located smack bang in the middle of the busy tourist precinct. A coral pink hotel, previously known as The Islander and once owned by mayor Tom Tate, has just been reborn as a cool boutique lodging—The Island. And trust us when we say, by the end of this article, you’re going to be totally crushing on the Coast’s newest hotel offering, too. A bold project taken on by Brisbane hospitality heavyweights the Bickle family, of the Press Club, the Empire and Cloudland—a family that’s renowned for seeing the potential and breathing new life into long neglected venues—we knew this old girl was in good hands. While The Island Rooftop launched back in December 2016 and has been attracting a steady trickle of locals back to the glitter strip over the summer, they are officially preparing to share the next stage of their stellar development with us all. Instead of taking the easy route to knock ‘er down, they’ve rescued this daggy two-star budget hotel from its time warp, converting the 98-room property into a four-star boutique hotel that’s full of character and sass. Among a strip of towering, rather non-descript high rises the Bickles have successfully managed to bottle up the relaxed essence of the Gold Coast with a twist of nostalgia. From the stylish reception area with its eclectic mix of classic couches and leather armchairs, vibrant throw cushions, lamps and blonde timber detailing, to the functional hotel rooms and suites with their vogue colour scheme, matte black bathroom fixtures and city views. There’s a lot to love about The Island. Downstairs, the poolside courtyard has a holiday vibe with pops of colour in the mosaic-topped tables and woven bistro chairs, rattan pendant lights and potted greenery, alongside cherry pop beach umbrellas and loungers lining the pool. There are plans for a pool bar to be added in time for summer and we can already picture this zone being a-buzz with breakfast diners sipping lattes in the sunshine. Cherish your own bed and don’t have any interest in dishing out cash to stay overnight at a hotel in your own hometown? Good thing there’s plenty beckoning on the food and beverage front too, and you absolutely must make plans to visit for dinner and drinkies or your next group shindig. The Island’s glittering new downstairs bar and Italian eatery literally fired up the Naples-imported wood fired pizza oven only moments ago, creating a cracking new dining option in the heart of the city’s busiest tourist hub. With floor to ceiling wood panelling, a luxe marble-fronted bar, statement pendant lights crafted with rattan and metal, vintage prints and photos smattered across the walls, and large windows if you just wanna linger over a glass of vino or craft beer while watching the world go by. We ate our way through a soul-satisfying Italian menu, prepared at the hands of a bustling kitchen full of talented chefs. From starters including the Eggplant Involtini with buffalo mozzarella, prosciutto and basil, zingy Caprese tomato salad with more mozza and fragrant basil, to spicy bites of fried Ascolana olives and a terra cotta aioli for dipping. In true Italian feasting style, the plates kept coming. Like a knife through butter, we shared the most incredible cut of meat; a 400-gram peppercorn-crusted Thousand Guineas Shorthorn rump with heirloom carrots, followed by pan fried Kingfish with clams, cuttlefish, mussels and saffron, to a flavour-packed plate of homemade truffle and ricotto gnoccho with mushrooms and braised duck that left our mouths salivating. Not to be outdone, the dessert menu is a total showstopper; from the Insta-worthy vanilla panna cotta adorned with dehydrated fruit salad, to the coffee semi freddo and Italian biscotti plate. Seriously generous servings for $12 and worthy of the food baby that’s certain to result if you’re tempted to order half the menu, as we did. 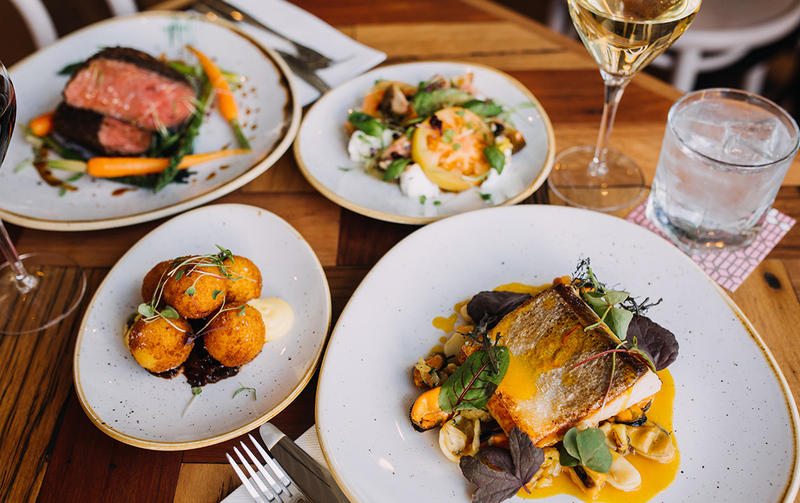 The Island’s hip new Italian-inspired restaurant and adjoining bar is now open for lunch and dinner, seven days, with finishing touches currently being made to the breakfast menu. Though the fun doesn’t end there. 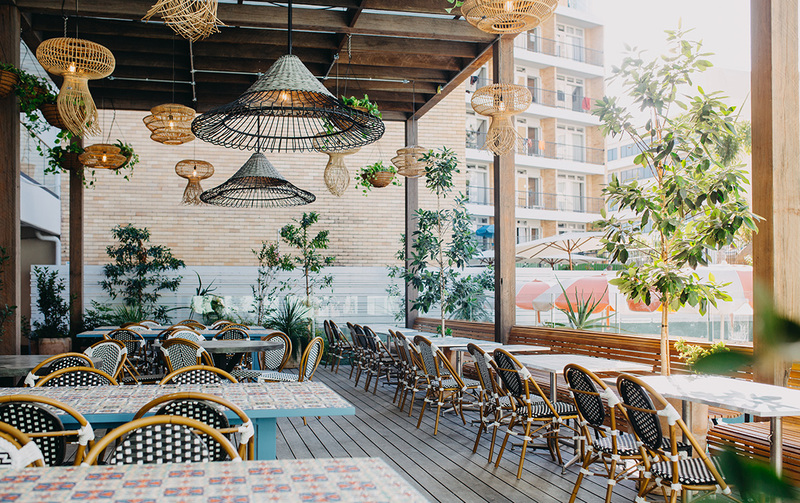 Home to the Gold Coast’s biggest rooftop bar and sprawling alfresco patio, The Island Rooftop is already bringing the cool back to the tourist precinct’s after-dark scene. With DJs, a retro-styled cocktail bar, ample seating, nooks and, in the winter months, heaters. Their new Gin & Jazz Thursdays are set to become a hit with Bliss Sunday sessions already heating up the wintery afternoons with DJs and live vocalists from 2pm. This weekend (June 10 and 11), The Island is throwing a family-friendly open house event with cutesy activities like a petting zoo, roving entertainers, ice cream cart, flower stalls and live music. So, make a beeline and take a peek at the Gold Coast’s newest boutique hotel offering in person. We bet you’ll wanna check straight in. Checked in and ready to explore? Here are seven of our fave beaches you absolutely must hunt down.